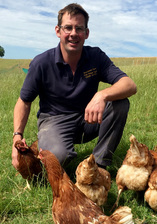 Beechwood Farm have been producing free-range eggs in Berkshire for the last 60 years. Their eggs are collected daily, then graded and packed on the same day. The eggs then typically hit the shelf or the kitchen within 36 hours of being laid! Compare this to a typical supermarket egg, which has to transit the supply chain. This means that local fresh eggs never tasted so good. Since 2001, FAI have formed and operated 1650 acres of Oxford University farmland. They follow a motto of 3 E’s; Economic, Environmental and Ethical sustainability. For them, putting the 3Es into practice provides direction for business to promote successful farmers, healthy environments and quality food.